I became involved with some interesting passionate people both here in LA. and in Japan. They are practitioners of an ancient Japanese Martial art using a stick to defend and defeat swordsmen. It is a wonderful workout and a rich heritage. Steven Bellamy Sensei in Nagoya hosted my stay there for ten days where I instructed his wife Chisato Mishima in the subtle arts of the groove drumming meditations. She is gifted and is already conducting drumming meditation workshops around Japan. Mike Belzer the practitioner here in L.A. who put all this together graciously invited me to perform at a demo in Little Japan. I love it. 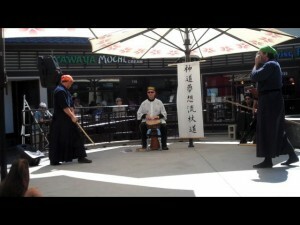 This entry was posted in Martial Arts Drumming, Uncategorized. Bookmark the permalink. This drumming is very inviting. I mean the meditation and the intensity of the japanese martial arts is what you feel i think.